1. Peel the celeriac and cut into small chunks. Put in a saucepan with the potato, cover with boiling water and cook for 10-12 minutes or until very tender. Halve the fish to make 2 portions. Put the milk in a small frying pan, add the fish and cook very gently, covered with a lid or foil for about 8 minutes until cooked through. Grate the lemon zest and measure 2 tsp of the juice. 2. Drain the celeriac and potatoes and return to the saucepan. Transfer the fish to a plate and keep warm. Pour the fish poaching juices into the pan with the celeriac and potato. Mash, season and spoon onto serving plates and place the fish on top. 3. Melt the butter in the wiped out frying pan. Once bubbling add the lemon juice and capers. Drizzle over the fish and sprinkle with the parsley and lemon zest. Serve with broccoli, peas or beans. 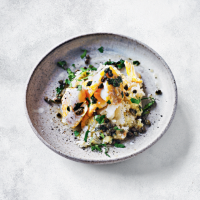 Cook’s tip Try using 2 x 300g Waitrose Celeriac Rice and essential Waitrose Mashed Potato cooked to pack instructions then mashed together.